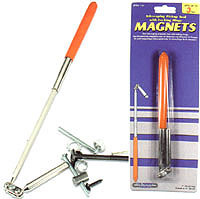 Lightweight magnetic pickup tool extends to 14" and contains a magnetic tip made from Neodymium, the strongest magnetic material available. Features sturdy body with grip handle. Adjustable locking hinge allows access around corners or in areas where an unusual angle is necessary for object retrieval.